Pirouettes can often be the dreaded part of dance class, but with a few tweaks you can improve your turning technique and ensure you are spinning across the studio. Often physical skills and attributes are deemed most important for pirouette success, however it is arguable that the recipe for success also includes attitude and approach, as much as the physical skills required to perform multiple turns. 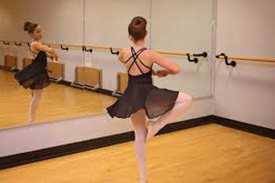 Common faults include being off balance, not engaging core muscles and holding the turn out, not coordinating the arms, head and eyes, not spotting something specific and not using the floor correctly when taking off, then not controlling the ending of the pirouette. In more specific terms, pirouettes depend on the dancer’s willingness to be brave and out of control. They need full-body coordination and a strong sense of balance while you are moving, as well as the ability to spot, some patience and strong spatial awareness. There also is the need to be able to alter your body during the turn in order to react to any additional variables, such as a raked stage, a misjudged take off or slowing music. Therefore dancers need to be able to be inconsistent with their turns to work out what works best for them, and not necessarily hold the body firm to continue turning. To this end, dancers must be able to adjust their balance in order to vary their turns, rather than employing a fixed state of technique and hoping for the best each time they take off into the pirouette. This cannot happen overnight however, and is something that is built up over years of dance study and practice. Keep your head up and your shoulders back, and you’ll sail round. Looking at the floor will only mean you will end up down there!